Two of my favorite designers. And I would wear the things Twinkle designs and creates. 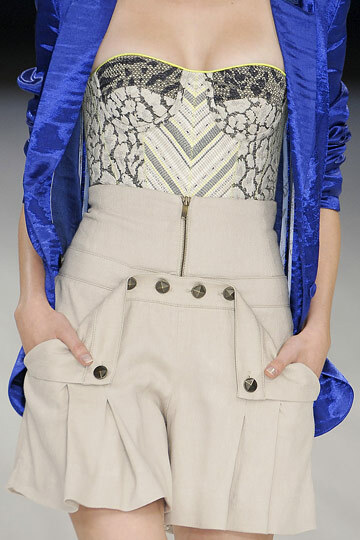 And I always have admired Matthew Williamson and his bold use of prints. And he really took it to the next level, with his draped dresses, and his corset tops. The dresses, I'm still iffy about, but they are different in comparison to everything else on the runways lately. Right now, my goal is to find something that actually really stands out in the spring rtws for 2011. But I totally understand the state of the economy as why they aren't taking as many risks as before. National Danish Performance started their world tour at our school!! :) It was a blast. Sadly, I don't have any photos from them. But you guys can check out there fb page. And they have a performance tomorrow night at the Kennedy Center for FREE at 6pm, if your in the DC area. Still busy. LOL... that doesn't seem to have changed. But my mindset has changed, and I believe I'll get things done, and I have the time to accomplish them. So.. just thinking that has made me feel a lot better. But I need some meditation and yoga though. Long weekend because of fall break!! Hopefully, leaving me time to catch up on my homework and projects, and have a bit of fun! ;) So excited for this break! How are you guys? Anything fun for the weekend? Gorgeous photos! I hope you have a wonderful weekend! Wow!!! Magnificent! Thanks for sharing! I'm going to check out more of this designer's work because I really like some of this clothing! this is amazing, i wish i get to visit a runway show once! !